Dexter Daily: Jennifer Carpenter Talks Deb: "I Work With This Character From a Very Emotional Place"
Jennifer Carpenter Talks Deb: "I Work With This Character From a Very Emotional Place"
The actress is standing beside a Southern California lake as Dexter assistants gently soak her. She’s preparing for a scene where she has to drag a body out of a water. Though it’s nearly 70 degrees and sunny, you get the impression she’s being stung by every drop. Watching this during a Dexter set visit a couple months ago, you initially think Carpenter is quite a handful. Star Michael C. Hall seems cool and capable on the set, while Carpenter is more like a exposed nerve. But as you spend more time around the actress and talk to her colleagues, your first impression is replaced by a more evolved one: Carpenter feels everything. That’s the way she works. Some actors are able to switch a character on and off. 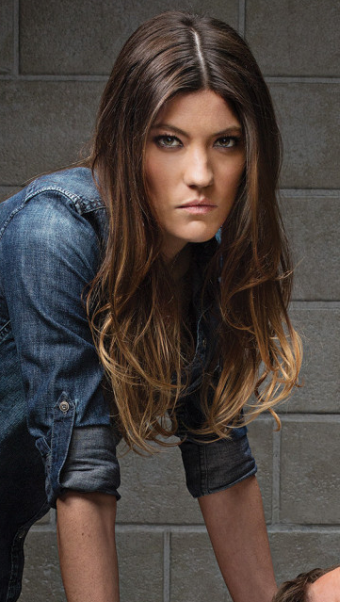 But Carpenter’s portrayal of the volatile Debra Morgan is more akin to a possession. “I work with this character from a very emotional place,” she says. “I don’t know how to do anything without going full out.” Read more after the jump. When she had to agonizingly shoot her police captain Maria LaGuerta in the shipping container in the seventh season finale, for instance. “It really ripped me apart,” she says, and haunted her for months afterward. Mouthing “I hate you” to Dexter in that scene was actually ad-libbed during a take and she didn’t realize she said it until somebody pointed it out later. Opening herself up to feel every ounce of her character’s pain is a tough way to work. But when you see the result of Carpenter’s performance in episodes like tonight’s eighth season premiere — where she’s strung-out and brimming with self-destructive self loathing — it’s all worth it. Though Carpenter has yet to be nominated for an Emmy, one could easily imagine that snub steak coming to an end. On the set after her lake scene, Carpenter shivers under a blanket, covered in, as she puts it, “pond scum.” She remembers the moment she realized Debra was the right role for her. One of the most oft-discussed components of her performance last season was Debra’s secret sexual attraction to her brother. Carpenter objected to the revelation — but not because it was, as some fans believed, out of character. Quite the opposite. Carpenter reveals it was very much part of her character and has been “from day one,” she says. She just wanted that information to remain off-screen. So it may be surprising, or perhaps not, that what Carpenter hopes to do next is precisely the opposite of a role like Debra Morgan. Carpenter would like to try a comedy series.